If I could, I would give you all that you ever wished for as your gift. 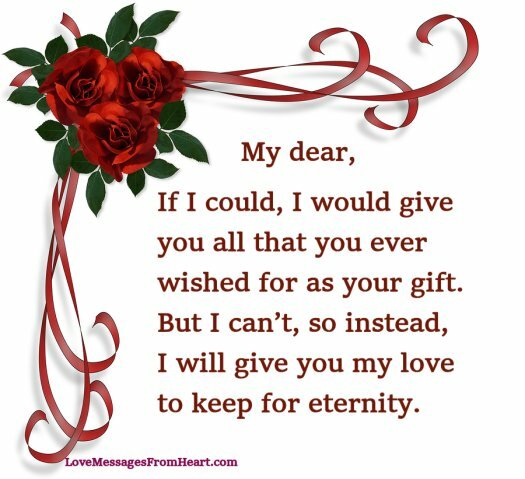 But I can’t, so instead, I will give you my love to keep for eternity. I want to give you a special gift, a gift that will stay in your heart, a gift that will warm your soul on rainy days and put a smile on your face at all times when you think of it. Sometimes, it is too easy to just go and buy a gift and then continue life as usual. Instead, I want to write my love on the pages of your heart and engrave my love into your innermost thoughts so that you will always carry my love with you. Being in love doesn’t make me happy. It’s being in love with you, year after year, that does the trick. Your gift of love is something I will always cherish. I always dreamed of having someone whom I could share my heart with. My dream came true the day I met you. Now that I have finally found you, I never want to lose you. My most precious gift. As Always this author write meaningful messages. Thank you.